As the film opened, young Hogwarts witchcraft and wizardry student Harry Potter (Daniel Radcliffe) was living during the summer (after his first year of studies) in the Surrey household of the Dursleys, Uncle Vernon (Richard Griffiths) and Aunt Petunia (Fiona Shaw). He had been raised by them after the loss of his parents, but was severely restricted, friendless and spent many hours alone in his room. During the arrival of Uncle Vernon's house guests, the Masons, Harry was warned by mischievous and masochistic house-elf Dobby (voice of Toby Jones) to not return to Hogwarts, because of "a plot to make most terrible things happen." Because of the commotion created, Dobby ruined the Mason get-together and Harry was framed for the disaster. Uncle Vernon vowed Harry would never return to Hogwarts to see his "freaky friends" and the boy was forcibly locked in his second-floor bedroom. Harry would have had difficulty escaping but was rescued by friend Ron Weasley (Rupert Grint) (with his two brothers Fred and George) driving an "enchanted" flying car outside his bedroom window. They drove to the Weasley farm, named The Burrow, where they had breakfast with Mr. and Mrs. Weasley (and saw Ginny (Bonnie Wright), Ron's younger sister, who had a crush on Harry). They then used Floo powder to visit Diagon Alley to shop for school items. However, Harry mispronounced the spell, saying "Diagonally," and accidentally ended up in in Knockturn Alley, a "dodgy place" according to bearded Rubeus Hagrid (Robbie Coltrane), the Hogwarts groundskeeper, who retrieved him and reunited him with the Weasleys, and with schoolmate Hermione Granger (Emma Watson). During their shopping excursion, they attended a presentation by famous magician and best-selling writer - the vain and egotistical Gilderoy Lockhart (Kenneth Branagh), who was selling his autobiographical Magical Me. Also in the bookstore was envious fellow student, the blonde Draco Malfoy (Tom Felton) and his menacing father Lucius Malfoy (Jason Isaacs). Lucius told Harry: "You scar is legend as, of course, is the wizard who gave it to you" - he was referring to Voldemort, who had murdered Harry's parents. At King's Cross train Station, the Weasley boys, Ginny, and their parents entered the magical wall barrier at Platform 9 3/4 to emerge at the platform for the Hogwarts Express train leaving for their school, but Ron and Harry found the gateway in the wall had been sealed - by the suspected Dobby (later confirmed), so they were forced to travel to Hogwarts in the flying car. After following the train, they crash-landed in the school's Whomping Willow tree, but finally arrived for their second year of studies in witchcraft. After escaping from harm inflicted by the tree, they (and their luggage) were ejected from the car and deposited at the school, and the vehicle drove off. Once at Hogwarts castle, Harry and Ron were ominously warned by caretaker Argus Filch (David Bradley): "This night might well be the last you spend in this castle. Oh dear, We are in trouble." The boys were reprimanded by Professor Severus Snape (Alan Rickman), head of the Slytherin House, for being seen by seven Muggles (non-magical folk) during their car misadventure, risking the exposure of their world to the outside, although reprieved by Headmaster Professor Albus Dumbledore (Richard Harris) and deputy Headmistress Minerva McGonagall (Maggie Smith), Head of the Gryffindor House (where Harry and Ron were members). Rather than the extreme punishment of expulsion, they both received detention. Once they were ensconced in their studies, they learned about repotting living Mandrake roots from Professor Sprout in Greenhouse Three, and were introduced to their new Defense Against the Dark Arts teacher - Professor Gilderoy Lockhart - who showed them freshly-caught although mischievous blue Cornish Pixies. The various Houses at the school trained and practiced for the competitive Quidditch games. The Slytherin House's new Seeker was introduced - the spoiled, pure-blood Draco Malfoy (equipped with new Nimbus 2001 broomsticks). Only Harry began to hear strange voices saying "Blood," "I smell blood," "Let me rip you," "Let me kill you," "Kill!," "It's time," and with his friends Ron and Hermione saw a threat written in blood on the castle wall, reading: "The chamber of Secrets has been opened - Enemies of the Heir...beware." There was an attack that literally petrified Argus Filch's cat Mrs. Norris, and Harry was suspected of being involved. During instruction by Professor Minerva McGonagall about turning animals into water goblets, she told the students about the historic legend of the Chamber of Secrets. It was learned that Hogwarts was co-founded many centuries earlier by four wizards: Godric Gryffindor, Helga Hufflepuff, Rowena Ravenclaw, and Salazar Slytherin. Slytherin believed that magical learning at Hogwarts should be selectively restricted only to all-magic, pure-blood families -- he left the school when he couldn't persuade the others of his views. According to legend, Slytherin built a mysterious, hidden sealed Chamber of Secrets in the Hogwarts Castle that could only be opened when his own true Slytherin Heir returned to the school to "unleash the horror within," and purge the school of all those who, in Slytherin's view, were "unworthy to study magic" (they were known as Mudbloods). [Note: Hermione was "someone Muggle-born...someone with non-magic parents."] McGonagall added: "No such chamber has been found." The chamber was "said to be home to something that only the Heir of Slytherin can control...the home of a monster." 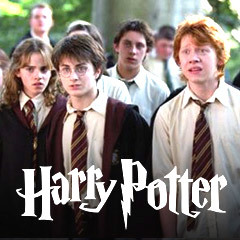 The trio of Harry, Ron, and Hermione strongly suspected that Draco Malfoy was the Heir of Slytherin, and to prove (or disprove) their theory, they concocted a brew of Polyjuice Potion (a complicated potion that required one month to create) to temporarily transform and disguise themselves into Malfoy's close friends, Crabbe and Goyle. Meanwhile, the major Quidditch competition (aerial-rugby) was held between the Houses of Slytherin and Gryffindor, pitting Harry directly against Draco. Harry won by catching the flying Snitch, although he injured his arm by a wayward and threatening Bludger, and while being treated in the school's infirmary, he continued to hear a voice urging him to "Kill." Dobby reappeared at Harry's bedside and urged him again to leave school and return home ("Terrible things are about to happen at Hogwarts...History is to repeat itself"). And then the school's photographer Colin was petrified and brought into the infirmary, as Dumbledore cautioned: "Our students are in great danger...Hogwarts is no longer safe...The Chamber of Secrets has indeed been opened again." There seemed to be a connection between the haunting of the girls' lavatory by the ghost of Moaning Myrtle (Shirley Henderson) (in the first film), and the previous opening of the Chamber. Professor Lockhart (assisted by Potions master Professor Snape) created a Dueling Club to train students in self-defense, given the recent circumstances. During a meeting with the students, Draco and Harry were called upon for a short demonstration with their wands about how to block or disarm unfriendly spells. Harry's opponent conjured up, with the command serpensortia, a talking cobra-like snake that spoke parseltongue (snake language), which Harry could speak too, since he was a parselmouth - an uncommon gift according to Hermione. She also explained that the symbol of Slytherin House was a serpent, and Salazar Slytherin was a parselmouth also. This led many students to think that Harry was the Slytherin Heir, and he was treated suspiciously. However, Professor Dumbledore and Hagrid both believed that Harry attacked no one. At Christmastime, the plan to use the Polyjuice Potion to turn Harry and Ron into Malfoy's friends to interrogate him was finally ready. Crabbe and Goyle were drugged by eating two muffins filled with a Sleeping Draught, and then hidden in the broomstick closet, while Harry and Ron wore their uniforms and drank the potion, with only one hour to question Draco. They learned that Malfoy was not the Heir of Slytherin (and that he didn't know the Heir's identity), but were told about how the Chamber of Secrets was opened 50 years earlier, and a Mudblood died. Draco expressed how he wished Mudblood Hermione would die this time around. When Harry went to the flooded girls' bathroom, he discovered a diary with blank pages, once belonging to 16 year-old student Tom Marvolo Riddle (Christian Coulson) when he was at the school 50 years earlier. Through the book's pages, Harry was taken back in time to be shown that Myrtle - a Mudblood girl at the school, was killed when the Chamber was then opened and an "ancient creature" attacked. Riddle wrongly blamed Hagrid and his pet spider Aragog (voice of Julian Glover) for opening the Chamber and for the attacks, to appease the dead girl's parents. After Tom Riddle's diary was found missing in Harry's room, Hermione was the next to be petrified, causing strict new rules to be instituted by the school: curfew by 6pm for students, and students would be escorted to lessons by their teacher. It was feared that the school's Chamber - "home of a monster" - would cause the closure of the school. Harry and Ron went to Hagrid's hut to ask him if he knew how to get inside the Chamber, fearing that he had opened it 50 years earlier. Hiding themselves in an Invisibility Cloak, they arrived as Professor Dumbledore and the Minister of Magic Cornelius Fudge (Robert Hardy) told Hagrid of three attacks on Muggle-borns, and that he was being arrested on suspicion, due to his past record. They threatened to send him to a faraway prison called Azkaban. Lucius Malfoy also entered, and announced that the board of governors of the school had ordered the suspension of Professor Dumbledore as headmaster. Before Hagrid left with Fudge, he hinted that Ron and Harry should follow a trail of spiders. The two boys proceeded to follow a spider trail into the Dark Forest, where they met with the giant spider Aragog, accused of killing Myrtle 50 years earlier in the bathroom. Aragog believed in Hagrid's innocence: "Hagrid never opened the Chamber of Secrets," and professed it wasn't the monster either: "The monster was born in the castle...It is an ancient creature we spiders fear above all others." They were surrounded by Aragog's hungry offspring, but were saved when the flying car appeared and brought them back to Hagrid's. In Hermione's clenched hand, Harry found a ripped page from the library describing the fearsome Basilisk, a giant deadly venomous snake capable of living for hundreds of years: "Instant death awaits any who meet this giant serpent's eye. Spiders flee before it." They realized the monster in the Chamber of Secrets was the basilisk, causing the petrification (but not death) of three students, because none of them had looked directly into its eye. Harry then understood why he heard voices: "That's why I can hear it speak. It's a snake." Hermione had learned that the giant snake was using the school's plumbing pipes to get around. And Moaning Myrtle was the girl who was killed 50 years earlier, and forever since had haunted the bathroom. The basilisk's latest snatched victim was Ron's sister Ginny who had become possessed and was taken underground into the Chamber itself. Harry and Ron found Professor Gilderoy Lockhart hurriedly packing to leave Hogwarts, and realized he and his books were all fraudulent - he was merely "taking credit for what other wizards have done." His one gift was Memory Charms, used to erase the memories of wizards and witches and take credit for their accomplishments. Together, they set out to find the entrance to the Chamber of Secrets. Moaning Myrtle described to them how she died by the sink, after seeing a "pair of great big yellow eyes." Harry found the entrance, located behind the girls' lavatory sinks, with faucets marked with a snake design. Harry's incantation of parseltongue caused the sink structure to open, and they tumbled down a long chute. The floor was covered with skeletal bones, and they also found a giant, shedded snake-skin. Lockhart attempted to steal Ron's damaged wand, use his Memory Charm gift, and take credit for everything, but it backfired -- Lockhart lost his own memory, and a rock slide separated Ron and Lockhart from Harry. Then after unlocking and entering a chamber portal where he found a concrete passageway lined with giant snake statues, Harry discovered Ginny's body - she was barely alive. He was confronted by former student Tom Marvolo Riddle, who revealed himself as "a memory, preserved in a diary for 50 years." He described how Ginny was growing weaker, as he was growing stronger - Tom blamed Ginny for opening the Chamber, unleashing the basilisk on the Mudbloods and on Filch's cat, and for writing the messages on the walls, although she was in a trance and under his control ("Because I told her to"). He described how the power of the diary scared her, and she tried to dispose of it in the girls' bathroom - where Harry found it. Tom also admitted framing Hagrid, and how he had preserved his 16 year old self in the diary's pages for 50 years, vowing one day to open the Chamber again and "lead another to finish Salazar Slytherin's noble work." He announced that his new target was Harry himself - he then revealed and admitted he was Lord Voldemort, the Heir of Slytherin: "Voldemort is my past, present, and future." The words of his name were an anagram for "I AM LORD VOLDEMORT" and he planned to be "the greatest sorcerer in the world." Suddenly, Dumbledore's red-feathered phoenix, named Fawkes, brought Harry the Sorting Hat, causing Tom Riddle to mock Harry: "A songbird and an old hat" -- and then summoned his own monstrous beastly force - the Basilisk, to battle against Harry Potter. Fawkes flew to Harry's defense and attacked the Basilisk's yellow eyes to blind it. Riddle then threatened Ginny's death, in order to steal her soul and regain power: "I will cease to be a memory. Lord Voldemort will return very much alive." Harry grabbed Godric Gryffindor's Sword from the inside of the hat, and was able to pierce the Basilisk's head through its mouth, but was bitten in the arm by its large venomous fang. He then defeated Tom Riddle by plunging the bloody poisonous fang into the diary. Ginny regained consciousness, and Harry's wound was quickly healed by Fawkes' tears and he was rescued. Dumbledore was reinstated as Headmaster, and he presented Ron and Harry with a Special Award for Services to the School. He also released gamekeeper Hagrid from Azkaban. Harry realized that some of Voldemort's powers were unintentionally transferred into himself through his forehead scar, as Dumbledore described: "It is not our abilities that show what we truly are. It is our choices." The Headmaster also told Harry why the sword appeared for him -- "It would take a true Gryffindor to pull that out of the hat." And enslaved house-elf Dobby was freed from servitude to his master, Lucius Malfoy, by a clever trick. [Harry accused Lucius of originally slipping the diary into Ginny's cauldron the day that they were shopping at Diagon Alley at the film's start.] Lucius vowed to bring revenge upon Harry like he did upon his parents: "Mark my words, Potter. One day soon, you are going to meet the same sticky end." And finally, Hermione and the other petrified students were reanimated with the administration of mandrake juice, as the school year came to a close (with school exams cancelled). Hagrid was given a round of applause by the students after personally thanking the trio for helping to extricate him from prison. A slightly darker film, the longest-running film of the series, and mostly faithful to its book source. With the same cast/crew members from the first film. With a production budget of $100 million, and gross revenue of $262 million (domestic) and almost $879 million (worldwide). Key Scene: In front of Hogwarts' students, Professors Lockhart and Snape picked Harry and his rival classmate Draco to demonstrate dueling techniques. When Harry's opponent conjured up a talking cobra-like snake that spoke parseltongue (snake language), Harry realized that he also had the mysterious and uncommon ability, as a parselmouth, to speak the snake language.